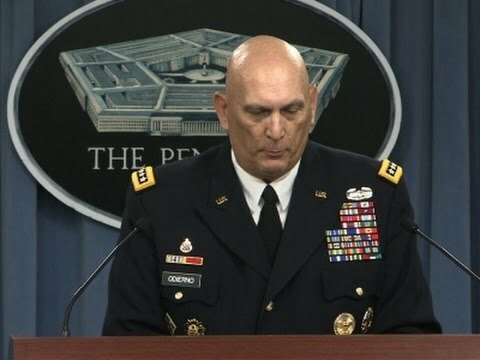 I think the remarks of outgoing US Army chief Gen. Ray Odierno on the possible partition of Iraq have been reported in a sensationalist way. He just said that Sunni-Shiite relations in Iraq are at a nadir and that the country could look different in the future. But he was careful to say that such decisions are for local people to determine, and that in any case the first order of business is to defeat Daesh (ISIS, ISIL). Still, he did get drawn into speculating about the partition of Iraq, which was probably unwise. Iraq will likely continue to have a Canada-like federalism with substantial provincial prerogatives, Quebec-style, for the Kurdistan Regional Government. But a formal partition, while possible, is unlikely and in any case would be a bad idea. Every time there is a big civil conflict in a country, pundits always rush to speculate about or even urge partition. I remember when I was living in Lebanon in the 1970s during the early years of its civil war, there were speculations that it would end up a set of independent cantons. But partitions are rare in in the post-war era. And the few that have occurred don’t offer encouraging examples. The United States was all enthusiastic to break South Sudan off from Sudan proper, in order to weaken one of Africa’s larger states and given that the Christian and animist population there had long chafed under northern Muslim Arabophone rule. But no sooner was South Sudan independent than it was largely abandoned by the US and it fell into a vicious and brutal civil war between the Dinka and Nuer ethnic groups. Moreover, its post-independence dispute with Khartoum led the latter to block its oil exports. So the takeaway is that a partition can often actually lead to more conflict. The newly seceded state may witness power struggles among rising new local elites no longer under the control of the old metropole. And, a partition doesn’t necessarily end conflict between the region and the center. The British partitioned both India and Palestine, and both regions went on to see many subsequent wars. In the case of Iraq, Odierno is not thinking straight. If Daesh is defeated by the Iraqi army, the Sunni Arab regions will be reincorported into the Iraqi state. Having lost troops in a war, Baghdad is highly unlikely just to turn around and let the Sunni Arab areas secede. If the latter have just been conquered by main force, they won’t be in a position to do so. Moreover, being ruled by Daesh, with its beheadings and harsh administration, may make the population more open to compromise once it is liberated by the Iraq national army. As for Iraqi Kurdistan, I should say that I am offering analysis, not doing politics. In principle I don’t care one way or another if Kurdistan is independent. But I don’t think it will have positive benefits for the Kurds. Formal independence for it would anger Iran and Turkey and could even lead to war. Moreover, Iraqi Kurdistan is a small place. I doesn’t have a big enough domestic market really to flourish without the rest of Iraq. If it were independent it might face tariffs from its trading partners. Iraqi Kurdistan doesn’t have all that much oil compared to the rich fiels of Iraq’s deep south. Why not stick around and enjoy that bounty as an Iraqi citizen? It should be remembered that petroleum won’t be valuable much longer, because of its role in climate change. Without an oil income or special access to large markets, it is hard for me to imagine how Iraqi Kurdistan will prosper 20 years from now. The world has enough small hardscrabble states.